1,629 backers pledged $103,569 to help bring this project to life. Thank you to our amazing backers! This project blew past our goals and hopes - we can't wait to get the Digispark Pros in your hands, watch the Project Updates for frequent updates on the status of the project. Update: The Robots Are Here! Get a robot car kit like the one in the video - starting at just $50 with everything you need to make an app or web controlled robot - check out the rewards! Update: Stretch goals are here! Shield descriptions, and more! ACHIEVED!!! - $75,000 - More shields and PCBs - we'll add the LiPo shield and at least one other - we'll also make available super cheap just the PCB for each kit. ACHIEVED!!! - $100,000 - Cheap LEDs and Special Edition! - We'll make the Kickstarter Digispark Pros with a special Kickstarter Edition silkscreen with a URL that goes to a list of all the backers. We'll make both RGB LED shields $1 each for backers only. $150,000 - You tell us?! Easier to use, more pins, more program space, more features, more reliable - supporting the entire existing Digispark ecosystem of 25+ shields and adding Wi-Fi, Bluetooth, BLE shields and more! Ready for all your projects - including mobile hardware development! All still super affordable! In August 2012 we launched the Digispark here on Kickstarter - we hoped to share with our fellow makers a cheap, open source, Arduino compatible that was easy to use and easy to program. The Digispark has been a hit - it is used by beginners and electrical engineers alike - from education to production to hobby use - and cloned and improved upon by some of the biggest names in open source hardware. The Digispark ecosystem now boasts an active forum, wiki, and 25+ shields. In the year and half that has passed since the launch of the Digispark, I've listened closely to feedback, complaints, bug reports, and unmet needs in the Arduino and Digispark communities. The result of which is the Digispark Pro! The Digispark and Digispark Pro Ecosystem! The Digispark Pro is designed to compliment the Digispark - it's the middle child between the Digispark and the full blown Arduino. It is even easier to use than the Digispark, even more compatible with standard Arduino examples, and packed full of i/o, more program space, and more features! With new shields and libraries the Digispark Pro is also the most affordable mobile hardware development platform! And it is still just as small as a Digispark, and just as affordable - because electronics should be accessible to all! With Bluetooth Classic, BLE, and Wi-Fi shields and examples for Android and iPhone - and USB Serial (built-in) connectivity for Android (devices with USB OTG supporting Serial devices) . Programming the Pro is as easy as hitting the program button when prompted to! The Digispark Pro uses the newest Micronucleus USB bootloader for programming which allows easy programming over USB direct from the Arduino IDE (or command line). A special thanks to Tim Böscke (the current lead contributor to Micronucleus) for adding support for the Digispark Pro. Micronucleus is the official bootloader of the original Digispark and it has been installed on over 40,000 devices. It is a completely open source, community driven project, and has proven to be the smallest, most reliable, USB bootloader for the Attiny series of MCUs. The Digispark Pro can emulate a USB Serial Port! This makes it as easy to use as an Arduino Uno for beginners/debugging! With the help of friend, LittleWire creator, and Digispark user Ihsan Kehribar (http://kehribar.me) - the Digispark Pro supports emulating a USB CDC/Serial Device - when enabled it shows up as a serial port on all major platforms (OS X/Win/Linux/Raspi/Android) - which means it will work with the Arduino Serial Monitor, other programs designed for Arduinos that appear as a serial port, and be much easier to integrate into custom programs! We also provide libraries for the Pro to emulate a USB Keyboard, Mouse, Joystick, or Generic HID Device, This means it can appear to your computer as if it were that type of device - allowing you to easily have your device type, move the mouse, act as a joystick, and more! Wi-Fi, Bluetooth, BLE, Mesh shields: The Digispark Pro is backwards compatible with all existing Digispark shields - and it has some shields exclusive for the Pro including: a Wi-Fi shield, a Bluetooth Classic shield, a Bluetooth 4.0/Low Energy Shield, and a nRF24L01+ low cost mesh networking shield. These low cost shields make the Digispark Pro the cheapest way to jump into Internet of Things, Mobile, and Wireless development! I2C, SPI, UART, LIN, USI: The Digispark Pro is ready to connect to just about any peripheral - it has stand alone SPI, a UART (with LIN capabilties), and I2C that is shared with a USI bus - which could act as a second SPI or UART for advanced users. This gives it all the bus options of an Arduino Uno and more! The Digispark Pro is made by Digistump - the company my wife, Jenni, and I started after the success of the Digispark. Digistump is committed to being an open source company - and everything we make is licensed under open source licenses - generally CC-BY-SA 3.0 and we make sure that the source files you would need to make one yourself are all available - including EagleCad sources and pdf schematics. All source files (Eagle sources, schematics, and all software/firmware) will be released when the project ships, if not before. The hardware will be released under CC-BY-SA 3.0, and the software will be released under CC-BY-SA 3.0, GPL, LGPL, and/or MIT - as required by the sources it was derived from. None of the licenses will prevent the Digispark Pro from being used in commercial projects, or require disclosure of the code uploaded on to them. We believe in transparency: All backers will be able to see their place in the shipping queue, and their estimated ship date at all times. The delivery estimates given for the rewards are for the start of shipping. We plan to produce these in-house and (if enough are needed) in a factory by contract. By overlapping those two methods of production we are confident we can absorb most unknowns and deliver on time. We are able to ship 200+ packages a day - and will not rest until all orders go out. We have a proven track record of putting our backers first, and we will continue to strive to deliver a quality product, on time, with excellent (and personal) customer service. The Pro will be well documented, to start with by us, and the community will be invited to expand the documentation as well. A wiki will be used for getting started guides, tutorials, diagrams, and more. Our community forums will be available for questions and our email support will be ready to handle hardware or shipment issues. We believe that a product cannot be successful without a combination of an active community and top notch support. The original Digispark benefits, and thrives, from a large, helpful, and very beginner friendly community. We can't wait to get the Digispark Pro into people's hands, and continue to expand that community. We believe in putting our open source community before business - and have gone out of our way to help other companies making derivatives of our products - like the Digispark. We put open source first, always, because we know we wouldn't be where we are without the open source companies that shared the knowledge we needed to build the Digispark and our other products. Easy for beginners and powerful for advanced users! You can add the WiFi, Bluetooth, BLE, and nRF24L01+/Mesh shields to any reward (you must have a reward selected). After you pledge you will get a Kickstarter message with a link to the Add-on page where you can add any of the 25+ shields! Robot Kit: We've added kits for the Robot shown in the video - you can get a complete kit to assemble it for Bluetooth, BLE, or WiFi usage - starting at just $50 - check out the rewards! And you can add extra Digispark Pros or shields from the Add-ons page after you pledge. Beta Tester Rewards: We are offering a super limited number of Beta boards. These will be assembled in house and will ship within two weeks of the end of the Kickstarter*. They will also include a special exclusive small surprise kit, that will only be produced for these rewards! These boards may differ slightly (in appearance and function) and may have small bugs - but you will be the very first to get a Digispark Pro by several months! The higher cost of these rewards cover the exclusive kit and small scale assembly. Early Adopter Specials: We have several reward levels the provide a significant discount for early adopters. Not only that, but early adopter orders will ship first. Reward levels for all: One Digispark isn't much use - so we've tried to provide plenty of reward levels for every type of backer from first time experimenter, to dedicated Arduino fans. The Digispark Pro is priced at $10 each, plus $4 per order for US shipping, and $5 for international. This reflects the actual cost of insured shipping. Online Project Guide: Kickstarter has kindly approved our reward with multiple Digispark Pros because our project guide will feature tutorials that required more than one Digispark Pro. From the basic getting started with the blink sketch, to wireless communication (two Pros), getting started with Mesh Networking (3+ Pros) - the online project guide will provide some easy to follow tutorials to get you started with some projects. It will be free to all Digispark Pro users. 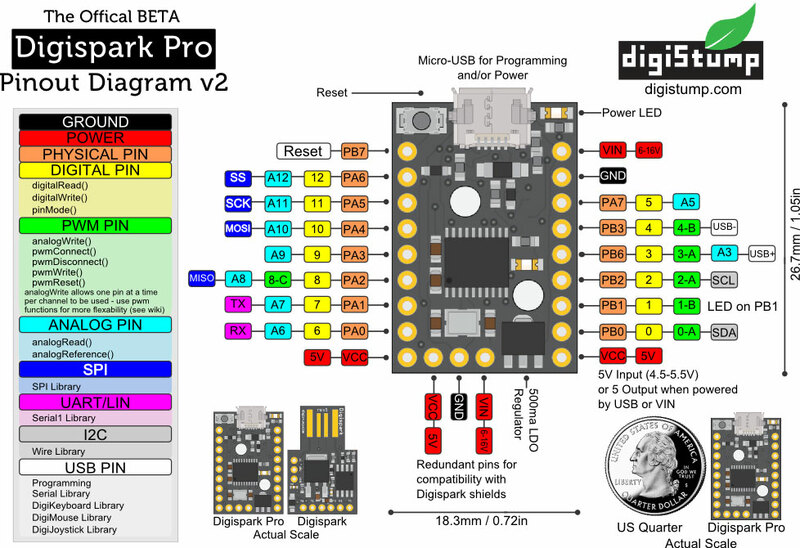 Exclusive Prices: Without shipping costs the Digispark Pro is about $10 (a third the price of an Arduino!). We want to get the Digispark in production and into your hands, so these prices represent exclusive discounted prices! For the Digispark Pro we have a split production plan. We will be producing it in-house and by contract (if demand requires it) so that even if one has delays the other can fill the gap. For sourcing we have partnered with Atmel to ensure that we can get the main MCU within our timeline. The other parts are available form multiple suppliers and can be easily substituted if necessary. Shipping will be done in-house and we have solid experience shipping 200+ packages a day - which will be the rate of shipment. Transparency is by far the most important thing when unexpected obstacles and delays arise - all backers will get a status page where they can see their place in the shipping queue as well as their estimated ship date based on current production schedules. Additionally, any delay will be promptly explained in an update. While we have lots of experience in production, sourcing, and fulfillment - things can and do go wrong - we've picked a date that allows for some error, but July should be considered a start date - we plan to start shipping in July and will ship 200+ shipments a day until they are all complete. EARLY ADOPTER SPECIAL! - One Digispark Pro! Shields can be added to any pledge (see main description)! Simple Start - Two Digispark Pros - ready for projects that need two (see main description), or one to spare. Bluetooth Digispark Pro - A single Digispark Pro and a Bluetooth shield! Jump into mobile hardware development! - More shields can be added to any pledge (see main description)! EXCLUSIVE BETA EDITION - Limited Beta Edition with Exclusive Shield Kit! EARLY ADOPTER SPECIAL! - A Trio! - Three Digispark Pros - ready for mesh networking projects (see main description), or anything else you want to do with them! A Trio! - Three Digispark Pros - ready for mesh networking projects (see main description), or anything else you want to do with them! BLE Digispark Pro - A single Digispark Pro and a BLE shield! Jump into mobile hardware development! - More shields can be added to any pledge (see main description)! Basic Robot Car Kit! - One Digispark Pro, Motor Driver, Motors, Wheels, Chassis, Battery Holder, and everything you need to hook it up! Make sure to add your own shields for control or intelligence! WiFi Digispark Pro - A single Digispark Pro and a WiFi shield! - More shields can be added to any pledge (see main description)! Bluetooth Robot Car Kit! - One Digispark Pro, Bluetooth Classic Shield, Motor Driver, Motors, Wheels, Chassis, Battery Holder, and everything you need to hook it up! Make an App controlled robot! BLE Robot Car Kit! - One Digispark Pro, BLE Shield, Motor Driver, Motors, Wheels, Chassis, Battery Holder, and everything you need to hook it up! Make an iOS controlled robot! WiFi Robot Car Kit! - One Digispark Pro, WiFi Shield, Motor Driver, Motors, Wheels, Chassis, Battery Holder, and everything you need to hook it up! Make an App or Web controlled robot!